I was delighted to receive a short-term Lisa and Robert Sainsbury Fellowship in the autumn of 2012. The Fellowship provided a wonderful opportunity for me to extend my research on washi, or handmade Japanese paper, in two ways: I curated an exhibition on washi held at Norwich University of the Arts (NUA) in the spring of 2013, and I wrote a short book, which was published by Kew Publishing in 2013, about the two collections in the exhibition. The Fellowship gave me valuable time and space to carry out research at the Sainsbury Institute, SOAS, the National Art Library and the Royal Botanic Gardens, Kew which built on earlier research on 19th-century washi that I had done for my master’s degree dissertation at the Royal College of Art in 2010. Thanks to the Fellowship I was able to consider a contemporary collection assembled in Japan by the Washi: The Soul of Japan Committee in conjunction with the 19th-century Parkes Collection held at the Economic Botany Collection at the Royal Botanic Gardens, Kew. Comparing washi made over a two-century period revealed that while dayglo dyes and fibreglass inclusions have expanded the decorative possibilities for the contemporary papermaker, traditional design motifs based on nature are still flourishing, as are such traditional dyeing techniques as stencils and tie-dyeing. washi in Japan through her organization Washi: The Soul of Japan Committee. The washi exhibition at NUA, called Washi: The Art of Japanese Paper, was very well received, and in fact appears to have set a new attendance record for The Gallery at NUA. Interest in the exhibition cut across a variety of communities: papermakers, conservators, historians, designers and artists, as well as those with an interest in Japanese arts and culture. The exhibition was visually arresting, with over one hundred examples of translucent, water-patterned, layered, textured, stenciled, resist-dyed and woodblock-printed pieces. The exhibition itself was complemented by various papermaking workshops at NUA, a day-long washisymposium at NUA, and by several exhibitions in Norwich organised by the International Association of Hand Papermakers and Paper Artists (IAPMA). This festival of paper and papermaking in Norwich brought together various communities with overlapping interests in washi and in papermaking and I hope was stimulating for everyone involved. 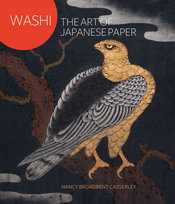 To accompany the exhibition I wrote a book called Washi: The Art of Japanese Paper, published in March 2013 by Kew Publishing. 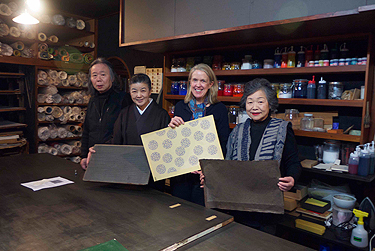 While Japanese paper is appreciated and admired throughout the world, little is actually known in the West about its rich history, its varied roles in Japanese life and culture, and the labour-intensive method of making it by hand. The book, which is aimed at the interested non-specialist, attempts to broaden knowledge about the art of Japanese papermaking within both an historical and practical context. As a final part of my Fellowship, I shared the results of my research with the wider community through giving gallery talks to groups of visitors to the exhibition and by giving an evening talk at the Daiwa Anglo-Japanese Foundation. I also co-organised and spoke at a day-long symposium on washiwhich brought together as speakers a British artist who paints and prints onwashi, a London-based washi retailer, an expert on traditional Japanese dyes, a British papermaker based in Japan, and one of the organizing members of the Washi: The Soul of Japan Committee. Going forward, I hope to arrange for the exhibition to travel to one or more museums or galleries in the US, where I believe there would be great interest in the rich history, striking diversity and beauty of both 19th- and 21st-centurywashi.